The Biennial Marijuana for Medical Professionals Conference is one of the most comprehensive professional cannabis conferences in the country. 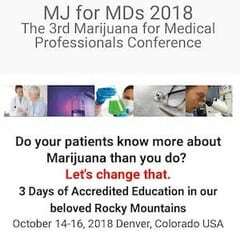 It’s the longest running medical cannabis conference in Colorado, offering certified Continuing Medical Education credits for doctors, nurses, health care professionals, and anyone looking to continue their medical education in cannabis. It also offers expert training for budtenders, dispensaries, MIPs, and labs, that count for Continuing Education credits. I’m excited to say I’ll be attending as press to bring you exclusive coverage of the event! I will be there for all 3 days on October 14th, 15th, and 16th, covering the entire event with live feeds and story posts on our Green House Healthy Instagram and Facebook pages. There will be a lot to cover and I’m looking forward to being educated by some of our nation’s leading medical professionals with expertise in cannabis. My written reporting after the event will be focused on two sessions surrounding cannabis and athletes. Dr. Uma Dhanabalan MD, will be presenting a session titled Athletes, Opiates, & Cannabis. Dr. Uma Dhanabalan has been an outspoken advocate for the use of cannabis in sports. Earlier this September, she was moderating the Docs and Jocks panel at the 2018 Cannabis Science Conference, where she discussed the medicinal benefits of cannabis in sports with a group of former professional athletes. In addition to her solo presentation at this year’s Marijuana for Medicinal Professionals Conference, Dr. Uma Dhanabalan will also be moderating a panel on athletes and cannabis with a group of former professional NFL and NHL athletes. I’ve seen Dr. Uma Dhanabalan speak in person before and she is very passionate about her belief in cannabis as an alternative to opioids. I greatly appreciate all the hard work she’s done to promote the use of cannabis in sports and I’m really looking forward to bringing you exclusive reporting from her presentation, and her moderated panel. The conference starts on Sunday, Oct 14th through Monday the 16th so be sure to check back the following Saturday, October 20th for our exclusive coverage! Tickets are still on sale and can be purchased here. This conference is being supported by local Denver company, Influential X. Founded by Melanie Rose Rodgers in 2017, Influential X combines Melanie’s natural inclination to drive business growth using her creativity, experience and marketing knowledge to produce influential, educational experiences. With Influential X, she’s found that creating events focused on education, advocacy, and social responsibility culminates in a positively engaged community in action. Last December, Melanie was recognized among her peers and nominated for Advocate of the Year in Colorado’s 2017 Cannabis Business Awards along with notable names such as Joe Rogan and Montel Williams.